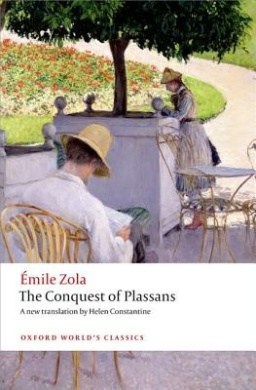 This entry was posted in 1874, 1892, Émile Zola, Commentary, Constantine, Helen, English, Lisa Hill (ANZ LitLovers), No 6 and tagged Émile Zola, Helen Constantine, The Conquest of Plassans. This book was such a fun, wild and crazy read. Absolutely. But I did feel sorry for the Mourets, despite their flaws. I loved this book…not quite up there with L’Assommoir, Germinal etc. but deserves more attention; hopefully the new translation will do that. I may be tempted to read the new translation as well. I though that Mouret was quite sane, even though everyone though that he wasn’t, and that it was only after he was committed that he truly became insane, or in other words he became insane because everyone acted as if he was insane. After all, all the examples of his insanity had reasonable explanations – reasonable to me anyway. Did you feel the same way? Or do you think that others just noticed his incipient insanity? I think he was just a bad-tempered, intolerant, intemperate man. Zola, I think, meant to show that the capacity for insanity was always there because of his heredity and that the asylum just brought out what was always there. But I think that, given what asylums were like in the C19th, anybody would became insane from being locked up in one of them. Just finished reading–possible spoilers! If you haven’t read yet, ignore my comment! So the more Zola I read, the closer I feel like I am coming to pinning down something about what he does that just fascinates me and that I haven’t really seen before. I saw it in the scene in Therese Raquin where Therese and Laurent furtively go for the weapons they meant to use to kill each other and there’s this moment where they look over their shoulders and catch each other red handed–he with his meticulously-researched poison phial, she with her kitchen knife. It is horrible, but it is so funny (maybe I’m the only one who thinks this). In ‘The Kill,’ Renee is disposed of carelessly and unexpectedly in a single line with a case of cerebral meningitis, almost as if Zola grew suddenly tired of her, like a child with a broken toy–her life, so intimately examined in this story, merits no more than this casual discarding. This too is both awful and weirdly funny. In ‘The Conquest,’ there’s this line: “And he rolled down the flaming stairs with the priest’s body; while Madame Faujas, who had sunk her teeth into him with all her might, drank his blood.” Now this statement is so over the top as to be ridiculous, and it is, and it feels like Zola relishes the fact and wants the reader to laugh in the midst of being horrified. He also wants to drive home how poor Mouret, who has been consumed to the very quick of his substance over the course of this book is still being drained by these people even in his and their death throes. The fact that it is so ridiculous actually makes the reader more susceptible to the real horror. It’s like a very dense one-sentence poem that sums up the import of the entire novel. The only comparable thing I can think of is the work of great lyricists like Fred Ebb or Stephen Sondheim. The other thing that struck me about this book, and I’d be curious to know if anyone else felt the same, was that the person at the center of all of this destruction, Abbe Faujas, was sort of a null. He was like a black cutout at the center of every picture he was in, lacking any discernible personality or interests beyond the acquisition of arbitrary power. I think this was also quite awful, and well done by Zola. Very often in situations where politics are manipulated to convince people to vote against their own interests, there is this maw of mindless, pointless, destructive, greedy power hunger at the center of it. It was dreadful watching the Mourets (who as you point out, Lisa, are not without flaws but deserving of pity) devoured by what almost seemed like a social fungus in the shape of the Faujas-Trouche complex and the influence they were able to wield with others who had known and trusted the Mourets for years. I’m still trying to figure out what all I make of poor Marthe. What a weirdly tragic figure. She sleepwalks through life until she is 40, then falls in love with a man who detests women and sublimates it into an episode of self-destructive religious mania. At no point in this story does she seem to be truly awake and aware until the end, when she suddenly realizes all she has allowed to happen and (too late), attempts to undo it. This may be pushing things too far, but in a way, Marthe may symbolize how average people deal with situations where the ruthless and powerful are dismantling all we hold dear, making us passive accomplices in their dirty work. We sleepwalk along, our minds filling in the things that have been stolen from us as if they were still there, until it is too late for us to do anything to avert the final disaster. This was a great read–bleak, but true. I have a lot more thinking to do about it, but meanwhile, have started ‘The Sin of Abbe Mouret.’ Amnesia! I cannot wait to see what Zola will do with a case of amnesia. Katie, I am loving your insights into these novels, it brings back the joy of reading them all over again. I’m happy you are willing to put up with me! It’s been very helpful posting thoughts about the books here as I finish them. It really helps me crystalize my thoughts, and as the books are so complex and layered, I need help! Katie, any time you want to join this collaborative blog and share your thoughts in a commentary, just say the word and I’ll join you up in a heartbeat. That would give you a place to crystallise your thoughts in a way that others could find them. Don’t be bashful, all of us are non-academics, just responding to the books as we find them.